Barry Cryer OBE is an English writer, comedian and actor. Comedy legend Barry Cryer OBE has been a regular face on television since the early years of his career when he appeared in the Frost Programme and Frost on Sunday. Since then he has appeared on nearly every panel game on British television, including That’s Showbusiness, Blankety Blank, What’s My Line?, Punch Lines and Give Us A Clue. Many of us have grown up with Barry's voice on the radio in the successful, long running radio programme I’m Sorry I Haven’t A Clue. The warmth, chemistry and repartee between the performers makes for easy listening and lots of laughs. The show is most famous for the rules of Mornington Crescent which no-one seems to understand (hence the title) yet it retains a large and loyal following. 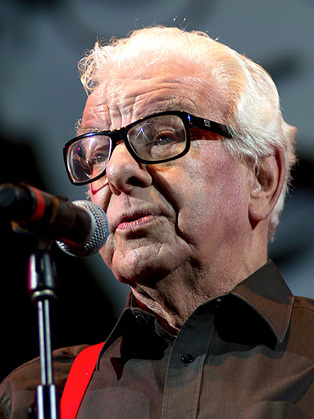 Barry Cryer has become one of the country’s most popular after-dinner speakers. He has spoken many times at the old Wembley Stadium at Cup Finals and International celebrations and for the Lords Taverners and for the Variety Club regularly addresses large audiences in London and the provinces. He has spoken before the Prince and the late Princess of Wales at both Guildhall and the Mansion House, entertained Princess Anne in music hall and shared speaking duties with the Duke of Edinburgh at the Savoy Hotel. He has spoken at tributes to Gene Kelly, Tommy Steele, Frankie Howerd and Harry Secombe. He appeared regularly on Granada TV’s Milord, Ladies and Gentlemen, a programme which featured the country’s leading after-dinner speakers. He has addressed and entertained at hundreds of corporate events, including; British Leyland in London and Vienna, The Coal Board, Avon Cosmetics, British Telecom, Smiths Foods, ITV Advertisers, the Institute of Bankers (3 times), Fiat (three-night conference), Websters Brewery (three-night conference), EMI and many more. He has presided over copious Awards ceremonies including the Sony Video Awards.